This recording was made on November 12, 2017, during a recital at the Indaba Festival of NewMusicSA in Tauromenium, Pretoria, South Africa. It is a recording of recent piano music from South Africa together with an early piece by Olivier Messiaen. Olivier Messiaen composed his 8 Preludes after the death of his mother, the poet Cecile Sauvage. They were dedicated to Henriëtte Roget. Influences of his mother’s symbolist poetry may be seen in the poetic titles. Musical inspiration is derived from Debussy, as well as Scriabin’s mysticism. Traits of his own style can be found in the occurrence of synaesthesia (and preference for the colours orange, purple, mauve, green and light grey) and his use of modes of limited transposition. 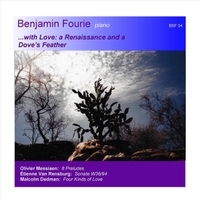 Étienne van Rensburg dedicated his Sonata of 1994 to Benjamin Fourie, It was inspired by the French film, Tous les matins du monde (All the Mornings of the World) about the French Baroque composer Jean de St. Colombe and his student Marin Marais. It shows a deconstructivist approach where in the beginning the focus is on a vertically orientated broken chord and a horizontal chromatic line. The second movement, TEMA (THEME), represents a musical “signature” where a note series is based on mathematical relationships between letters in the composer’s name. A “moving back in history”, with the reference to the Renaissance Villanella, interspersed with fragments of the second movement in crab motion, characterize the third movement. In the fourth the element of melody is prominent, as demonstrated in the Baroque Ricercare and the last movement shows an assimilation of previous ideas, functioning like a recapitulation and a catharsis, centering the energy. Malcolm Dedman completed his Four Kinds of Love in 2008/9. This work is dedicated to his wife, Anja. An ostinato pattern characterizes the left hand in the first part, contrasted by a modal melodic pattern in the right hand. A jazz blues feeling and atmosphere of playful congeniality is prevalent. In the second part meditative chords are contrasted by running figures, depicting the play of light. In Love of God for Man the melody revolves around small intervals, creating a feeling of calm expectancy and the last part starts with bell-like sounds. The orientation is spatial and the music permeates peace.